The Golden Retriever Lifetime Study and the future of human medicine. 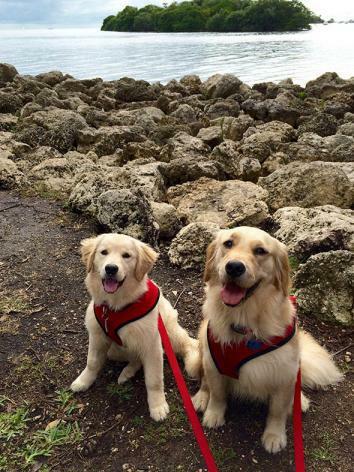 What 3,000 golden retrievers tell us about the future of medicine. The variation in human lives is one of the things that makes medical research complicated. You can’t easily control people’s diets, movements, and circumstances for their entire lives in order to determine what factors relate to which diseases. We would resist that kind of control. 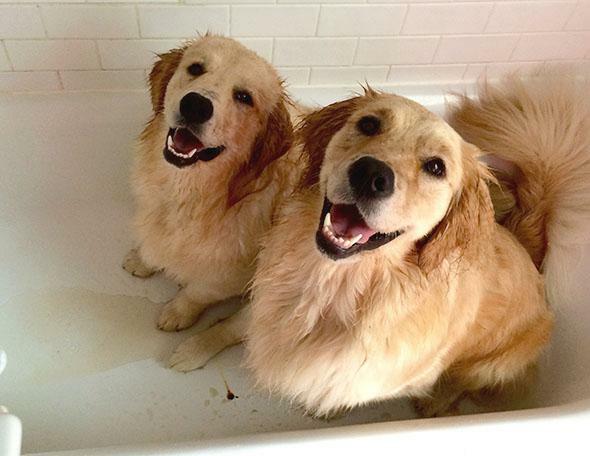 In contrast, my two golden retrievers, Hopper and Venkman, have pretty routine (and awesome) lives. They spend most of their days in the house, lounging on the couch or the floor. They spend a few hours running around my little backyard and maybe an hour on walks around the neighborhood. They eat the same food from the same bowls, drink the same water from the same pipes, and beg for the same snacks every day. Their environment is relatively limited. “The intent of the study is to identify the major genetic, nutritional, and environmental risk factors for … cancer but, by extension, all other major health problems of golden retrievers and dogs in general,” said David Haworth, veterinarian and CEO of the Morris Animal Foundation. The Morris Animal Foundation has probably touched your life if you’re a pet owner. It is a nonprofit that funds hundreds of studies on animal health, and these studies are especially focused on companion animals like dogs and cats. Research it funded is responsible for many of the vaccines your dogs and cats receive, like those for parvovirus and feline leukemia. The funding comes from donations from individuals and corporate sponsors like Orvis and Blue Buffalo. Since it was founded in 1948, it has spent $92 million on research. That puts the magnitude of the golden retriever study in perspective; it is the largest observational veterinary study ever conducted and will cost $25 million. Each dog in the study is genetically profiled and has an annual visit in which blood, stool, urine, fur, and nail samples are taken. Once a year, owners fill out extensive surveys detailing environmental and behavioral information: the type of pipes in their houses and the types of flooring they have, where the dogs sleep, what kind of food they eat, what their bowls are made of, how often they walk, how much sun exposure they get, whether the dogs show any aggression, and if they chase shadows or lights. It took me about 45 minutes per dog to complete the surveys this year. The dogs and owners will do this every year for the dogs’ entire lives, an average of 10–12 years each for the breed. Because there is so little genetic variation among these purebred dogs, it makes it easier to identify genes that are related to certain types of cancer or other diseases. That may in turn lead to a greater understanding of those genes in other dogs and even other species—like, perhaps, humans. Kathryn Bowers, co-author of Zoobiquity: The Astonishing Connection Between Human and Animal Health, said that our shared genetics mean that insights from one species, like dogs, can help humans too. (Bowers is a fellow at New America; New America is a partner with Slate and Arizona State University in Future Tense.) “The genomes are different, but they are similar enough because of our millions of years of shared biology … that finding cancer clusters in other animals can help point the way toward suspicious regions on the human side,” she told me. Borrowing insights from dogs and other animals is one thing. But is it possible to do a similar long-term study of genetics, environment, and nutrition in humans? It might already be happening. 23andMe, the at-home genetic testing company, uses genetic data from its 800,000 customers along with surveys to link genes with health conditions and personal traits. On March 12, 2015, it published a paper in the Journal of Investigative Dermatology on genetic variants that are linked to the skin condition rosacea. Another article on genes linked to motion sickness was published in Human Molecular Genetics in January 2015. The results came from tens of thousands customers responding to surveys on the website that were linked to their genetic profiles. 23andMe is betting on the future of this process. On March 12, it announced the creation of a new therapeutics division, designed to develop therapies and treatments based on the customer genetic database. It is not a big step to link that kind of genetic and survey data with detailed information about our environment, activity, and nutrition. Your phone is already tracking your movements in a detailed way. And apps and sites like MyFitnessPal—which has more than 75 million registered users—let us record detailed logs of what we eat. Combine this with some public records and maybe even some electronic medical records, and the information available on hundreds of thousands of humans could be detailed enough to do the same kind of long-term observational research the Morris Animal Foundation is doing with dogs. Of course, such an aggregation of our personal data comes with a host of ethical questions. Who owns our data, can our genetic predispositions be used against us, and what control do we have over the research? Concerns over the implications of sharing this genetic data are already beginning to surface. 23andMe has begun selling access to its database of genetic records, and this has highlighted the tension among seeking out scientific advances, protecting users’ privacy, and driving for profit Silicon Valley–style. While we sort out that conundrum, our fluffy friends will go on living their pampered lives, breaking new scientific ground—for their health and ours—over the next decade.